Uing Siri is a quick and easy way to find a set of photos. When guests visit, we love having a Photos slideshow playing on our Mac. However, if guests show up with little or no advance notice (as they tend to do during the holiday season), you’ve got little (or no) time to go picture hunting. 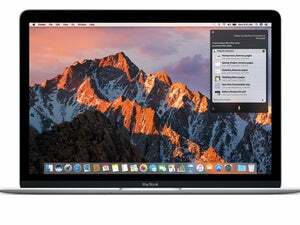 Happily, macOS Sierra lets you tell Siri to track down certain pictures for you. From that point, all it takes is a couple of clicks to get a slideshow rolling. The first step is to ensure Siri is enabled. If it is, its colorful, round icon should be sitting pretty near the far right end of your Mac’s menu bar. To summon Siri, either click the icon or hold down the Command+Spacebar for a second or two. 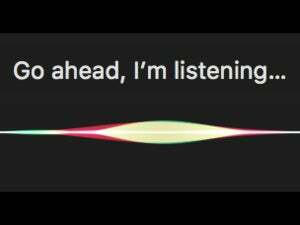 A window slides into view from the right edge of your display and you hear a friendly sound to indicate that Siri’s listening. Now speak your command, as explained in the next section. (If you keep holding down the Command+Spacebar keys, Siri continues listening. Let go of those keys to signal that you’re finished giving it commands.) If Siri isn’t enabled, choose Apple > System Preferences and click Siri. In the pane that opens, turn on Enable Siri. You can use preferences to enable and disable Siri, pick a language, voice, sound input, change Siri’s keyboard shortcut, and show or hide Siri’s icon in the menu bar. You can phrase your question in various ways, too. You can say “create” or “play” or “show” and the result is the same: the Photos app launches, the pictures are tracked down and they begin to play in a soundless slideshow. Thankfully, Apple is constantly improving Siri and Photos, so in the future you may be able to search for additional attributes. Feel free to try anything you can think of. To play a slideshow of the pictures Siri located for you, select some or all of the pictures in Photos and then Control-click or right-click on one of the selected photos. From the menu that opens, choose Play Slideshow. Pick a theme and music from the next window that opens, as shown below. When you’re finished, click Play Slideshow to trigger a glorious, full-screen slideshow of the selected pictures. 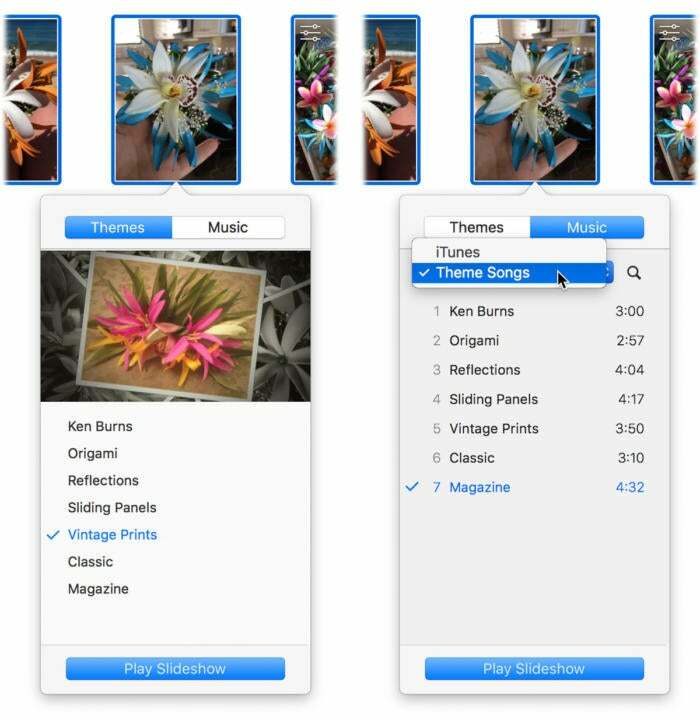 Photos has several slideshow themes, though Vintage Prints is especially beautiful because it slowly zooms in and rotates one photo while stacking the others in black and white behind it (left). You can play the music linked to any of the Themes, too, or you can choose iTunes to see a list of all your songs and pick one or more to play (right). There are some advantages to saving your slideshow before playing it (besides being able to play it again whenever you want). For example, you can control the slide timing and transition style, and choose whether the pictures are scaled to fit on the screen. To do it, choose File > Create Slideshow. 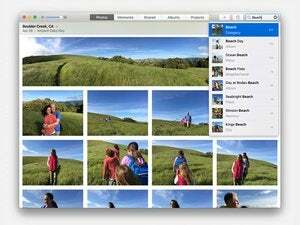 A sheet drops down from the top of Photos’ window where you can choose to either add the selected photos to a previously saved slideshow, or create and name a new one. 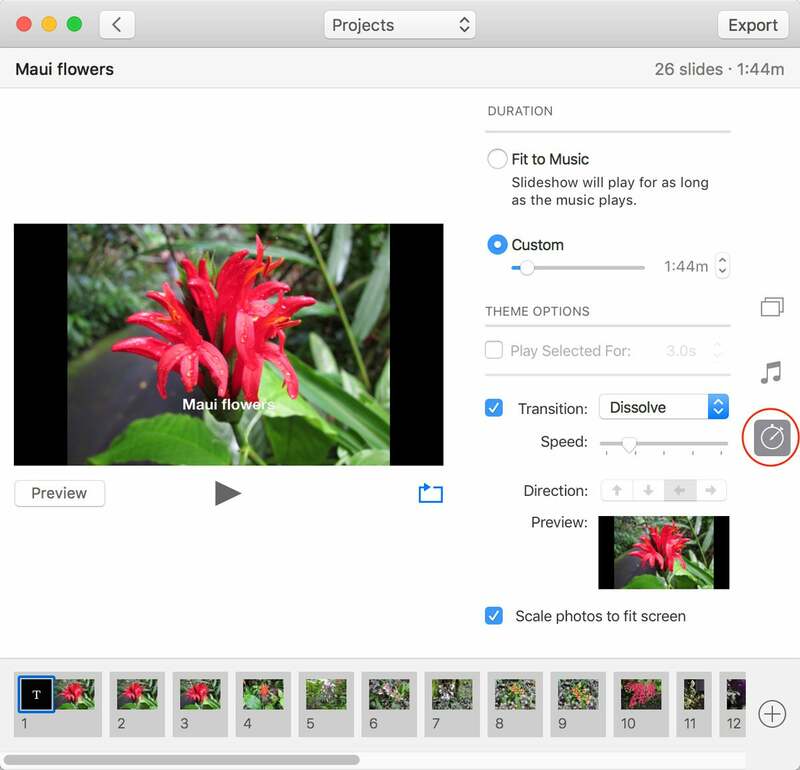 Either way, the slideshow opens as a Project in Photos, with icons on the right that let you customize how it plays. Click the Duration icon (circled) to set slide timing and transition style, and whether the photos are scaled to fit on the screen or not. The other icons let you pick a theme, change or disable the automatic music that plays during the slideshow, or choose songs from your iTunes library. To preview your slideshow inside the project window, click the Preview button at the bottom left beneath the preview area. To repeat the slideshow indefinitely, click the rectangle-arrow at the bottom right so that it turns blue, which turns on looping. To start a full-screen slideshow of the selected pictures, click the triangular Play button. As you can see, using Siri to find pictures is incredibly fun, and playing them as a slideshow for your guests can be immeasurably rewarding. Until next time, may the creative force be with you all!